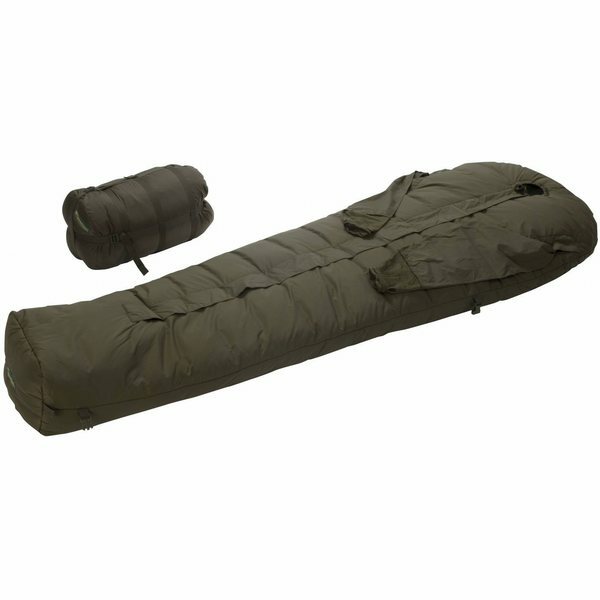 This high performance winter sleeping bag was especially designed for military use. It has generous draft tubes on the inside of the zipper to prevent any heat loss there. Anti-snag tape along the zipper and a protection flap on the outside keep out wind and wetness. The SURVIVAL ONE has a differential cut which means that each successive insulating layer is cut more generously. This ensures the greatest possible loft in all areas and in every sleeping position. Movement inside the sleeping bag creates pressure points but with our differential cut only the innermost layer is compressed. By opening the zipper at the bottom you can get your feet out if you want to step outside. You can tie up the foot end so that you can walk and even wear the bag like a coat. The sleeves are stored between the insulation layers. Tuotteen koko pakattuna tai myyntipakkauksen koko on arviolta 570 x 300 x 290 mm. Erinomainen makuupussi,nukkui lämpimästi kotateltassa parimillisellä solumuovilla -10°C. Hihaominaisuus on hyvä, se antaa tilaa ja mukavuutta yläosaan ja avattava alaosa mahdollistaa liikkumisen pussin kanssa. Tarkenee! 3 yötä nukuttu pussissa tähän mennessä. -17 C pakkasta ja lämmintä oli. Erittäin lämmin ja sopivan kokoinen pussi.